CapitaLand's 3Q/9MFY17 earnings were within expectations at 22%/81% of our FY17 forecast. Singapore residential continues to see good take-up but minimal remaining inventory. China dragged by lower handover but sales remained good. Maintain Add with a slightly higher target price of S$4.25. 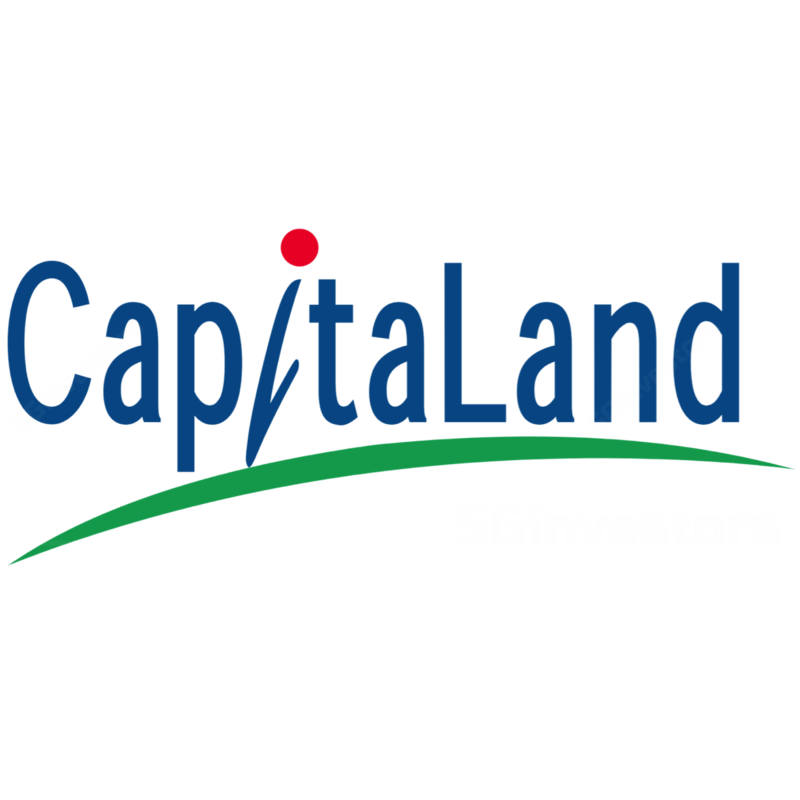 CapitaLand reported a 10% increase in revenue to S$1.5bn while net profit of S$317m was 18% lower yoy. Excluding revaluation and divestment gains, core net profit was S$205m, -19% yoy. This was due to lower handover of residential projects in China, partly offset by new contributions from newly-acquired/opened malls. 3Q/9M core net profit was in line with expectations, at 22%/81% of our FY17 forecast. Singapore 3Q EBIT rose 49% yoy largely on the back of Wilkie Edge divestment gains. On the residential front, the group clocked in 108 units in sales (valued at S$373m), mainly from Victoria Park Villas (94% sold), Interlace, Sky Habitat (90% sold) and Marine Blue (74% sold). Going into 4Q, we expect contributions from newly-acquired Asia Square Tower 2 (by CCT) to add to Singapore group earnings. China 3Q EBIT was 20% lower yoy as only 1,630 residential units (worth Rmb3.24bn) were handed over during the quarter (vs. 3,254 units in 3Q16, Rmb4.68bn). CAPL has a remaining Rmb13.8bn worth of pre-sales (of which c.Rmb1.4bn will be recognised in 4Q) and another 605 new units to be launched. This will continue to extend the group’s China residential income visibility. Meanwhile, other overseas markets, such as Vietnam, continue to lock in higher sales volume and value. EBIT from the shopping malls unit doubled in 3Q on consolidation of CapitaLand Mall Trust CMT, CapitaLand Retail China Trust CRCT and RCS Trust as well as higher contributions from its China malls. The retail portfolio enjoyed high occupancy, in excess of 92%, as well as greater shopper traffic and tenant sales growth. This helped push same-mall NPI growth to 7.9% in China and 13.8-23.1% in Japan and India. It has expanded its mall management contracts to seven with the addition of Alibaba Shanghai Centre. This will boost its fee revenue and retail network. The Ascott unit reported higher EBIT in 3Q, thanks to a stable portfolio REVPAU and additional contributions from newly-acquired or opened properties. It recently acquired its first property in the Silicon Valley and planned to develop the lyf Funan Singapore and Ascott Sudirman Jakarta. This will enable the group to move towards its 80,000-units under-management target by 2020. The net debt-to-equity ratio stood at 0.43x at end-Sep post the consolidation of CapitaLand Mall Trust CMT, CapitaLand Retail China Trust CRCT and RCS Trust. Average debt maturity is 3.3 years and about 72% of its debt is on fixed rates. This puts the group in a strong position to continue deploying capital into its core markets of Singapore and China as well as Vietnam and Japan. We leave our FY17-19F core EPS estimates unchanged post the results but adjust our RNAV to S$5.31 due to higher target prices for its REITs. 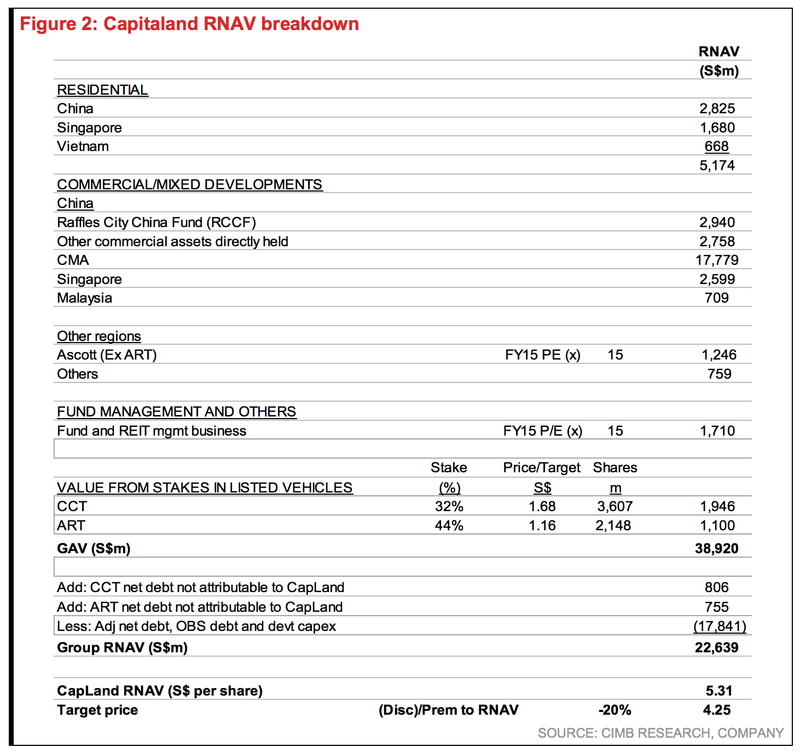 Accordingly, our RNAV-based target price for CapitaLand is lifted slightly to S$4.25 (20% discount to RNAV). Continued reinvestment into new RNAV-accretive projects and capital recycling are key re-rating catalysts. Downside risks include slower-than-expected redeployment of capital.